I had been waiting far too long for this 2nd installment to come out and finally – yesterday came and i was a happy camper. I really wanted to take time away from work to read but of course that never happens. So, finally when i got home around 8p i was able to pick up the book, and read it straight through to the end. 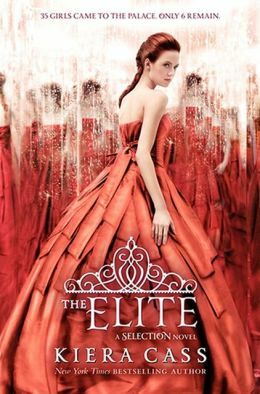 The Plot: We pick up the story coming out of the ending of The Selection where Prince Maxon has decided that because of the rebel attacks, he was going to skip some of the individual eliminations and go straight to narrowing down the group to The Elite 6. Because America wasn’t fully sure where she stood with Maxon and her feelings towards Aspen, she didn’t know if she was for certain staying, however we all know that Maxon has significant feelings for her and she was the final girl chosen to remain. So this is where the story starts off. The girls, Celeste, Elise, Natalie, Marlee, Kriss and America are the remaining girls. Instead of such casual activities, the girls are asked to take on more and more in preparation for one to be the princess. They are given ‘projects’ to show if they are able to handle and understand the responsibilities that they will undertake as well as allow the royals to see which girl the country feels best about. (since we know it’s not all about how maxon feels, it’s really about the puppet-master his father). As the story progresses, we see that Maxon continues to be completely ‘in love’ with America and gives her far more attention than he does anyone else. America is completely confused about what she wants since she’s decided that she’s going to see where her relationship with Maxon goes, but she’s still connected to Aspen since he’s not willing to give up. It’s really hard and we see some of the 17 yr old angst come out with America. In this story much more than in The Selection, she tends to be a bit wishy washy and i actually wanted to smack her a bit. Going back to the girls for a second, we know that Celeste is vying for the crown more than Maxon which is fine, Elise realizes (some what) that she’s there for her ties to New Asia, Natalie and Kriss are there because they are ‘nice’ and America is there for ‘passion’ If you remember back to the Selection, Marlee and America had some tension and the reason behind it comes out more in The Elite. you get real clarity on what’s going on there and it makes for a great story and tense scene. So as this story progresses, we see relationships really changing. We see that Maxon really wants things to work with America but she keeps going back and forth, because she’s jealous, because Aspen is in her head about things (good and bad) and she’s really uncertain of herself (which is totally fair). Where this story leaves us off is a cliff hanger of sorts. personally, i’m rooting for The One (book 3) to go a certain way however i’m not sure what’s going to happen. i kind of hope that it’s a REALLY LONG final book of the trilogy since there’s a lot that needs to be resolved. 3) Do we think that Maxon is playing games with everyone? or is he true to what we see? 4) is Maxon’s father the king like Gergory Illea? Is that somethign to worry about? 5) what are the rebels searching for? why do they keep attacking and will everyone be safe? 6) Will America use the phone number that she got from the Italians for anything and how will that help since Italy isn’t quite an ally yet? so many questions – and we have to wait until 2014 i think for answers. happy reading! This entry was posted in Dystopian, Reviews, Young Adult and tagged Dystopian, Kiera Cass, The Elite, The Prince, The Selection, YA lit by iscm13. Bookmark the permalink. I’m thinking (or hoping rather) that America uses the phone number she got from the italians to gain an alliance ONLY if she’s chosen. This will give her ammo with Maxon’s father. I’m also hoping for a longer final book. The first two were so engrossing that I devoured them within hours. I want more!! I so agree on the desire for a longer finale. The first two were good but I wish they were longer.